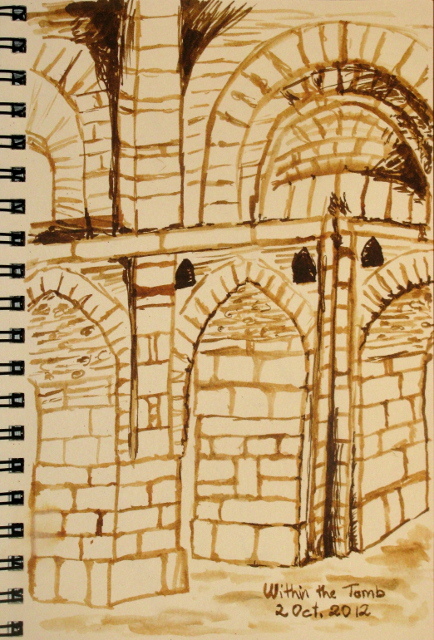 A collection of sketches from October. Sand crabs straining food from the waves done while walking on the beach. 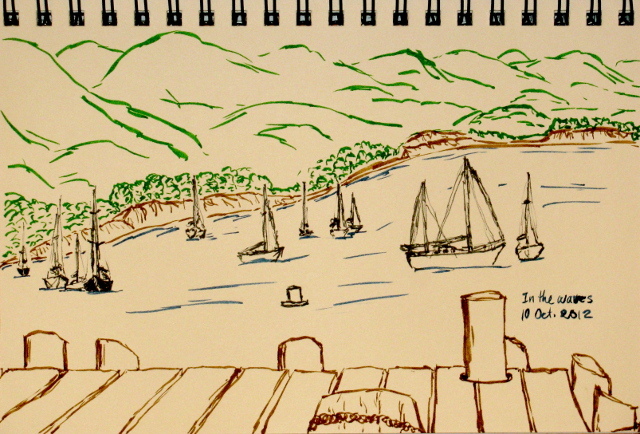 The moored sailboats east of the wharf. The pools at Gaviota Hot Spring. 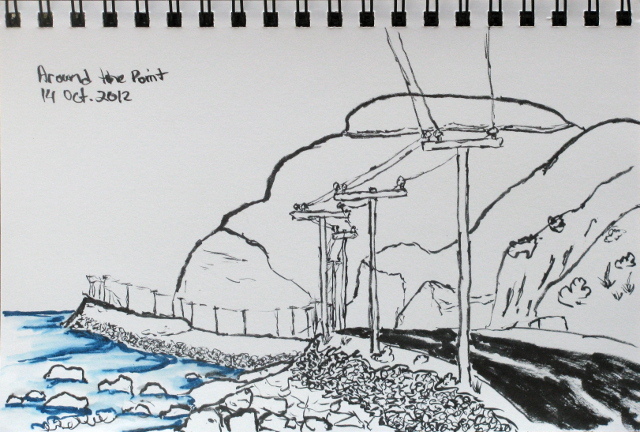 Stopping along highway 1 near Point Mugu, on the way back from Leo Carrillo. 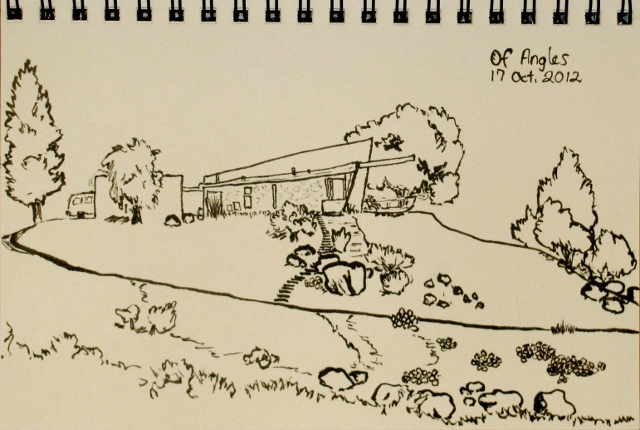 A house up on Yellow Hill, from a photo taken on the hike a few days before. 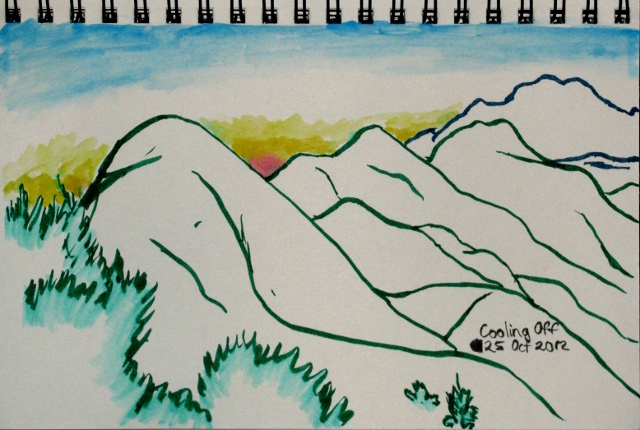 Quick sunset representation while hiking back down from Warm Springs Mountain. Warm Springs Mountain once had a fairly short trail up to the top. It was once a well maintained trail, according to my Afoot and Afield, and although the mountain was burned, it would surely be repaired soon and continue to be a simple hike to the top. Unfortunately, there seems to be a general policy of neglect for the area which once contained a condor sanctuary and some of the last wild condors, at least that is what my reading would seem to indicate. I once tried for this peak in the past, but didn't know about the neglect, only the enthusiastic expectations. 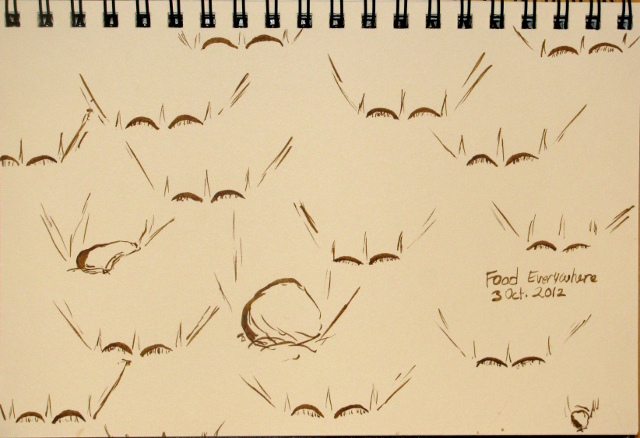 I didn't get far through the then 23 years of free growing brush then, but I returned now with a different plan. The old lookout was serviced by fire roads which provide a second route to the top, albeit more than twice as far as the hiking trail. These roads are easily visible in satellite photos but the only report of them is a nearly three year old track taking the first part and a mountain bike trail for a loop and gives very little indication of the state of things, but does seem to maintain a reasonable speed. I print out the most useful bit of the Warm Springs Mountain quad from USGS, which contains all the trails and roads, and arrive there with a plan. I will start at the gate across the road and head up to the lookout. If I spot the mountain bike trail forking off, I will take it. I hope that the trail will be slightly shorter than the road and hopefully more interesting. Taking a left at the top of the trail or a fire road intersection, and then a left at a fork, I should find myself at the top of a peak that may or may not have any indication that it once had a lookout at the top. From there, I might try to take the trail down or I might take the road. I expect to want to try the trail. I drive a little way past the spots made familiar by my failed attempt at this mountain to find the expected fire road just as a touch of civilization pops up, noticing on the way that the gate on Ruby Clearwater Road is open. I turn into Warm Springs Road (Warm Springs Fish Canyon on the map) to see a road that looks good enough to drive, but has a solid gate closed across it. I find a place to park to the side of Lake Hughes Road and make my way up the fire road. A bit of water flows in the creek bed to the left and a few buildings are high on a flat to the right. Footprints in the dirt show I am not the only one to pass this way. The canyon is cool and shady. I pass the remains of a structure on the far side of the creek and soon leave behind both water and buildings as the creek dries out. The start of the road based route up to the top of Warm Springs Mountain. I joined up for another stroll with Hike the Geek, this time heading up the other trail at Leo Carrillo, an old fire road called Yellow Hill. It boasts ocean views, yielding a few islands on a clear day, as it climbs up into the hills. I parked along Mulholland and we met in the state park parking lot. After waiting for no-shows, we crossed the highway and wiggled around the gate on the fire road to start up the route. We met two more a short way up. A lifeguard tower guards a particularly rough section along the coast below. I decided to go up to the top of Gaviota Peak, partly since there'd been some rain to help clear up the haze of the air and partly because I'd been thinking about going up but not gotten there. Since I failed to find the path under the highway and the rest of the trail on the other side, I decided to try from the fire road off the southbound side. After the "end freeway" sign, there is quickly a bridge and a few feet later, the bit of paving marking the road. I park to the side of the gravel just after the pavement ends and before the gate, then go looking for the pedestrian underpass. The hint from looking at the satellite photos suggest it's a bit to the north where apparent paths seem to come from the highway. 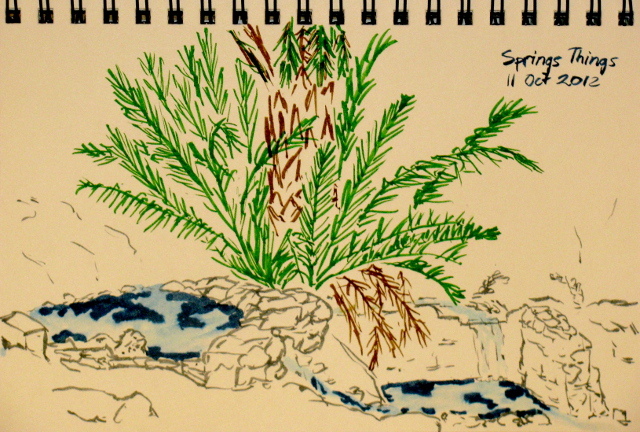 I cross over Gaviota Creek and up the concrete hill northward and around some vegetation to find it a bit south again. The creek is well shielded from it, just as it was well shielded from the creek by this vegetation. 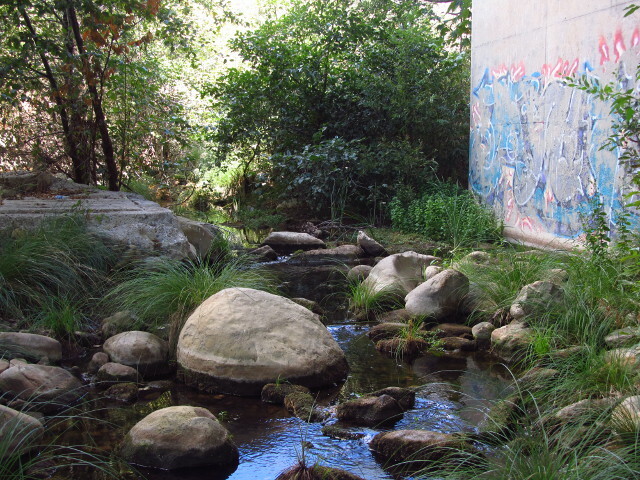 Gaviota Creek, which is somewhat decorated below the highway. The southbound side of the highway can be crossed with the creek, but the northbound needs a tunnel. 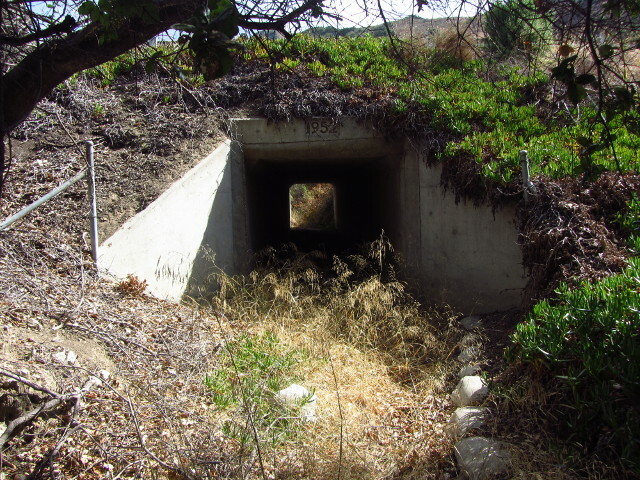 The underpass is actually quite clean, but the far side has a lot of poison oak coming up quite close to it. 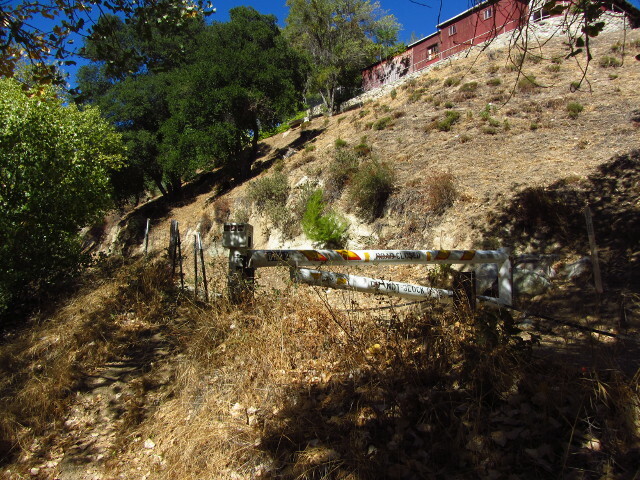 It also looks as though the trail is still here, except that it also seems to go through the thickest of the poison oak. I try to follow it without getting too much poison oak on me. At first it seems clear, just overgrown, and there are bits of cut branches on the bushes, but I must have pushed through the wrong soft spot between bushes, because I stop seeing the cut branches and the trail starts seeming a little short for the average human. Then I even lose those routes. I make my way toward the grassy hill to the north which seemed to be where the trail is supposed to go from photos and maps pushing through the easier spots of the bushes, a bit up into the branches of the bushes shedding cotton when the soil is a little muddy from a seep of water. Past the wet stuff, the bushes dry out and then end as I find myself at the bottom of the grassy hillside. Looking back over the stretch of bushes to the hills on the other side of the highway. 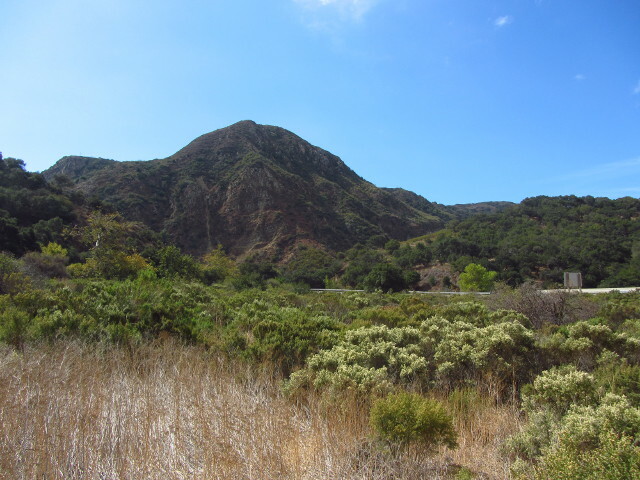 The left peak has the antenna I hiked to on my last Gaviota visit and the cut of the fire road I came down is also visible. I decided to go out for a late afternoon leg stretch to Sterns Wharf. I hadn't even remembered, but Wednesday is a particularly good day to do this. The afternoon "low" tide was just under 3 feet and a few hours before, so the cliffs by Leadbetter Beach are impassible. 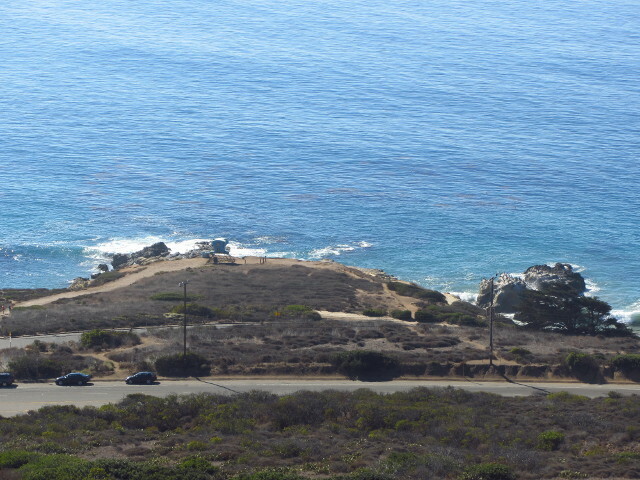 I try anyway, but that last point of land going from below Shoreline Park to the beach has surfers washing up along it. It is all surge and no beach. Going back up and coming down along the paths brings me to the wide beaches where it's easy to walk no matter what the tide level. Well, nearly, I've seen 12 foot storm surge and it doesn't leave much beach. 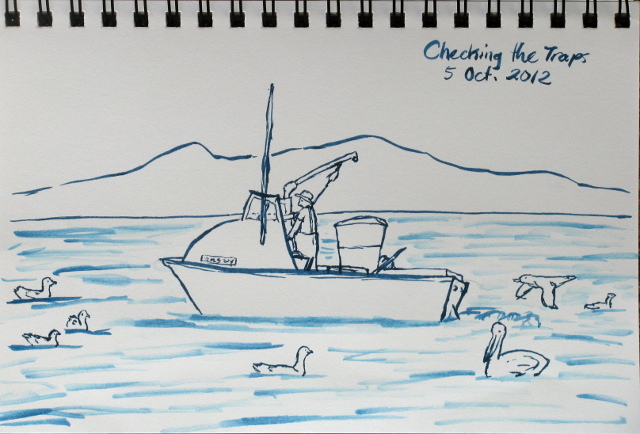 Today, there's a bit of kelp washed up and the birds are picking it over for their meal beside a very calm sea. 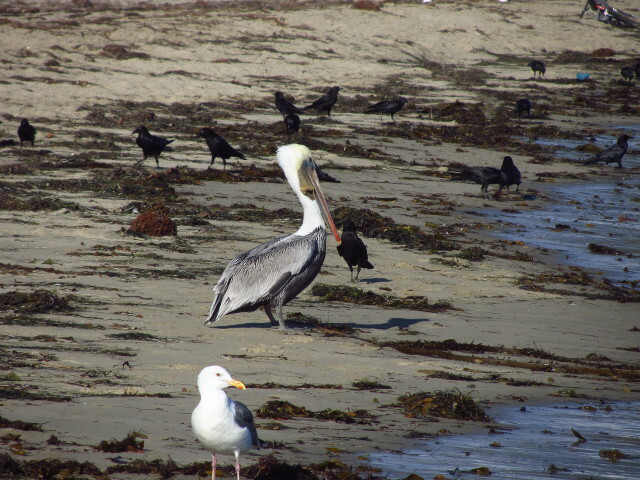 Usually happier bobbing on the water, I found a pelican on the beach.